Application Submittal- Ryan Company Inc.
An example submittal is provided here. As you can see we lay out all the involved parties as well as the equipment being used, and how it meets the needs of the project. 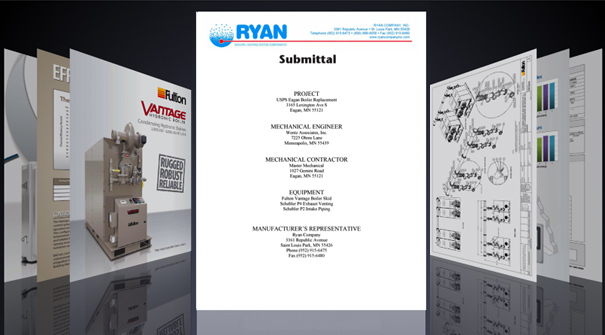 Although the submittal process is relatively universal for all companies, Ryan can provide you with a summary of the equipment involved in the project and highlight the areas of how the equipment meets your needs of the system. The Submittal will summarize the equipment either ordered or to be ordered for the project. No single submittal will fill the needs of every project possible, because no one project is exactly the same as another. We will create a customized submittal that will fill the needs of the specific project, engineer, and building owner. Hopefully this will expedite the process for everyone involved.